It was a 240 mm rocket - a type of weapon provided to Shiite extremists by Iran – that attacked the headquarters garrison of the American military in Iraq two days ago, a U.S. general said Thursday. One person was killed and eleven were wounded during the "indirect fire" attack Tuesday against Camp Victory, which includes the headquarters of Multinational Forces-Iraq. But such an attack with a sophisticated weapon against a nearly impregnable compound - far less vulnerable than the Green Zone in the heart of the capital - sends a strong message to the Americans that nowhere in Iraq are they safe - even in the nerve center of the U.S. mission. It represents a major confrontation between the U.S. and armed Shiite groups the Americans insist are supported by Iran. Maj. Gen. Kevin Bergner said the rocket was launched from a populated area in the Rasheed district of west Baghdad, which he said was infiltrated by breakaway factions of the Mahdi Army militia of anti-U.S. cleric Muqtada al-Sadr. Bergner said the rocket was a type of weapon that Shiite groups "have received from Iranian sources in the past and used against coalition forces." A 240 mm rocket was fired against a U.S. base south of the capital in mid-August. "The Iranian... rocket is the only 240-milimeter rocket found or fired in Iraq to date, and Jaish al-Mahdi is the only group known to fire that rocket," Bergner said, referring to the Mahdi Army by its Arabic name. Displaying a twisted piece of shrapnel from the attack, he said military exerts had so far determined its markings and manufacture were "consistent with" Iranian produced munitions. "Can I hold up a piece of fragment today that has a specific marking on it that traces this back to Iranian making?" he said. "At this moment I can't do that, but explosive experts - as I said - are still analyzing all the different fragments that they have gathered." Camp Victory, a huge area located near Baghdad International Airport, has occasionally come under fire, but attacks with such a large number of casualties and with such sophisticated weapons are rare. Bergner would not say where the rocket hit and would not speculate what part of the base the insurgents were targeting. In Washington, Petraeus said the U.S. military had "very, very clear" evidence of Iranian involvement in such attacks. "It certainly has contributed to a sophistication of attacks that would by no means be possible without Iranian support," Petraeus said at a news conference Wednesday. "Rockets - very particularly 240-millimeter...there's no question where they have come from." 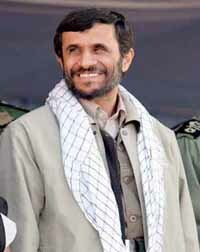 Iranian President Mahmoud Ahmadinejad rejected Petraeus' and Crocker's congressional testimony accusing Iran of interfering in its war-torn neighbor. In an interview on Iranian state television, Ahmadinejad said the top U.S. officials in Iraq raised allegations of Iranian meddling solely because of the political debate within the United States over the war in Iraq. "Iran has no need to interfere in Iraq. The Iraqi government and nation are close friends of Iran," he said. Bergner insisted the U.S. had a "good sense" of the rocket's source - Iran - based on the color, recent manufacture and markings on fragments. He said Shiite extremist leaders under U.S. detention had acknowledged that Iranian Quds Force operatives were providing 240 mm rockets to Shiite militias. Last month, al-Sadr announced a freeze of operations by the Mahdi Army to give time to reorganize the force, but Bergner said not all of the militia was following the order. "There are indications that some of his followers are fulfilling that pledge of honor," Bergner said. "We have seen other indications of others who are not fulfilling the commitment he made. We know there are some that are not operating within the bounds of his guidance." The military said the victims of Tuesday's rocket attack were a mix of American military personnel, other coalition troops and civilian contractors. The fatality was a civilian contractor from a third country, meaning neither American nor Iraqi, he said. Also Thursday, the U.S. military said a joint three-day operation between Iraqi troops and U.S. Special Forces netted 80 prisoners and killed three suspects in the Hamrin Ridge and Diyala River Valley areas of eastern Iraq. Among those captured were four suspected al-Qaida in Iraq terror cell leaders, the military said in a statement. The U.S. said Iraqi troops also seized 40 AK-47 assault rifles and machine gun ammunition. More than 1,000 Iraqi soldiers took part in the operation, it said. Meanwhile violence continued in Baghdad on Thursday, with Iraqi police saying six people were killed and 18 wounded whena bomb hidden under a parked car exploded near Sadr City. The bomb was apparently aimed at an American convoy, but missed its target - killing all civilians and setting shops in the area on fire, police said. In eastern Baghdad, a roadside bomb killed one person and injured two others, police also said. And near Samarra, 95 kilometers (60 miles) north of the Iraqi capital, authorities said about 60 gunmen attacked a police station Thursday and ignited clashes with residents and police - leaving four assailants dead and two policemen wounded. The attacks came despite the start of the Muslim holy month of Ramadan, which began Thursday for Iraq's Sunni Muslims, and Friday for the country's majority Shiites. Tradition requires faithful to abstain from eating and drinking from sunrise to sunset during the monthlong observance. The U.S. military issued a statement Thursday saying it had begun releasing between 50 and 80 Iraqi prisoners a day as a gesture during Ramadan.